Pandora has taken the jewellery industry by storm over the last few years. I mean, who doesn't own one of their stackable rings? I for one know that in my household alone, we own several Pandora earrings, bracelets and rings - in fact, we could be stockists! And today I want to introduce you to a new member of my Pandora family their Classic Elegance Ring*. 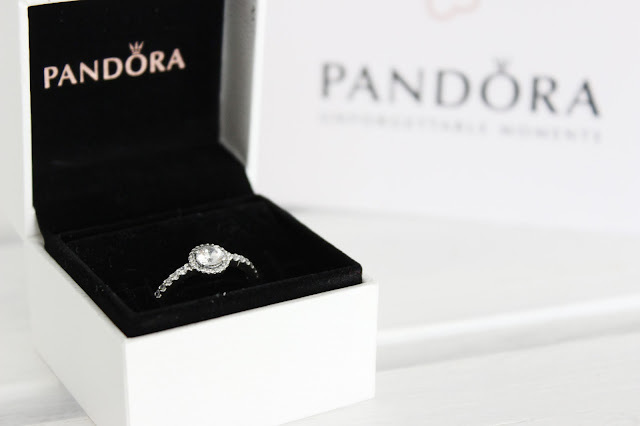 The sparkly number from Pandora was kindly gifted to me from Mococo official Pandora stockists and online jewellers, who stock a wide selection of jewellery brands including Thomas Sabo, Swarovski and Olivia Burton. The Pandora Classic Elegance Ring arrived beautifully gifted wrapped and once I pulled the ribbon and opened the box, my inner magpie was overwhelmed with joy when I set eyes on the dazzling cubic zirconia. The stone isn't too large, or too small and is set on a sterling silver band of shimmering stones and as I don't have the most delicate of fingers, I get more stones - bonus! The hand-finished, vintage-inspired solitaire ring is elegant, classic and simply stunning. The ring can be worn alone or with sleek bands and looks expensive, yet is reasonably priced costing just £60.00. Pandora never disappoints and more often than not, proves you don't need to spend hundreds of pounds on a big name brand to get a special piece. And with Valentines Day just around the corner, there's no better time to treat yourself (a.k.a start dropping hints!). You can find Pandora online at Mococo here. Do you own any pieces from Pandora?